My name is Liz. I am a mother to 7 wonderful children, but only 6 are here on earth. 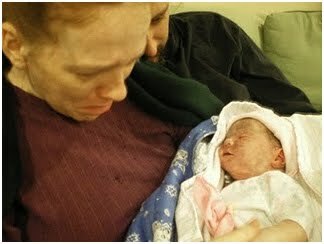 My daughter Aquila died on December 19th, 2009 during my homebirth. I remember so much about the day, as it was burned into my head like an iron brand. Some things time does not heal, it only solidifies. Midnight on the dot my eyes opened. I thought, "Why am I awake?" Then I felt a pop, followed by a gush. I waited for the gushes to subside so I could waddle to the bathroom and grab a pad. I texted Faith (my CPM-midwife) and Amy (my best friend/doula) to tell them my water broke. I was having contractions every 5 minutes, and was very excited, so I played on the computer till about 4am. Then I decided that nothing much was happening, so I should try to sleep. Surprisingly I fell right asleep and slept in till 6 AM. Awhile after I awoke, I called Faith to check in, and went about my morning. By 11 AM contractions are regular and Amy had come over, along with Yoshimi (a hair braider). I bounced on the birth ball while she braided my hair and told me about births in Japan. Amy and I joked. At 11:45 AM, I called Faith to tell her I was getting in the tub because the contractions were too strong for me. We call the photographer who comes out to capture the labor and birth. We also call my dear friend Bethany to watch the children (because they are coming in every few minutes to "check on me"). Faith arrives at 2:15PM (14 hours after my water breaking). Aquila's heart tones are in the high 170's and my temp is almost 101. They all are trying to cool me off with cool cloths and tea. The pain is intense and when I check myself I cannot feel very much cervix. At around 3:45PM everyone is out of the room except me and Faith. I pass three chunks into the tub. I pick them up to throw them away. They are blood clots, hard, gelatinous, and about 1-2 TB in size. (Faith records this in her notes as "bloody show.") At this point Aquila's heart tones are at or above 180. Faith checks me, because I am acting and feeling like I must be in transition- INTENSE, almost non-stop contractions, and "pushy" feelings, and retching from the intensity. I am only 5-6. This is where I lost all calm and got scared. There was no way I could do this, and now Faith was wanting me to get out of the tub to try to cool me down. After getting out I notice I am dripping blood, which I show to Faith. I labor for some time out of the tub, and the contractions don't ever stop. I remember saying, "They just don't stop. They won't let go!" The hospital was 3 MINUTES from my house. But that meant NOTHING when bad, bad things were happening and I was in hard labor. I t took at least 30 minutes to get to the car. 30 MINUTES. My contractions at this point were what is called tetanic - never stopping. This is a huge red flag of an abruption. I could not take a step without a contraction. My doula at this point says to Faith, "Should we just call EMS? It will be faster than getting her dressed and downstairs?" Faith says no. I make the most physically painful journey of my life down the hallway, downstairs and out to the car, only to find Faith wants me to go in a different car than hers, which at the time made no sense and still does not. Why would you leave the laboring woman to drive without a care provider? As I am trying to climb into Amy's passenger seat I have the urge to go - you know that am I about to push out this baby feeling? I make it back to the living room, where I yell for my son to get off the couch. Bethany herds them upstairs. I don't even get my underwear off (those stretchy, post-birth, throw away ones). She slips out into my hands, completely limp, in a river of blood. Faith had packed up all her equipment, so she had nothing to even suction Aquila, so she was sucking blood out with her mouth. She yelled for someone to get her the bulb syringe and call 911. She and Amy started CPR while I sat on the couch next to Aquila. I held her foot, limp and pale, and rubbed it. It took EMS 12 minutes to get there. When they came in they took over with Aquila and Faith came and sat in front of me watching the paramedics work. I asked Faith if she (Aquila) could live after this long. She said, "She is not going to make it". Here is my second biggest regret of my life (second only to choosing homebirth with a "hands off" midwife). The paramedics asked me where we should take Aquila. They suggested Dell Children's Hospital - saying that they had a better NICU than the hospital 3 minutes away (later to find out this was not true). They said they would take me to Brackenridge, which they said would let Aquila come to me at that hospital- completely untrue. Brack and Dell were about 20 minutes from my house. Longer to bleed for me, longer to not be in a hospital for her (though I wish the EMTs would have called time of death at my house, so I could have just had her with me). We are put into separate ambulances. Gabe goes with her, Amy with me. When I get to the hospital I end up passing out from blood loss. They do two manual extractions of clots to get my bleeding to slow. I find out after this that she has been declared dead and Gabe is coming to the hospital. Gabe ends up in the ER about an hour after getting there from a migraine (stress) that makes it hard to see. They give him a shot of morphine. At this point I am freaking out because they are saying they cannot bring Aquila's body from the other hospital - the only one who can pick her up is the medical examiner. Apparently, since she died at home they opened an investigation. At this point the med examiner was threatening an autopsy without our consent. I would not even be able to see my baby until days later, possible after being cut up. All I wanted was to hold my daughter, see her and tell her goodbye. I never did, at least not until 3 days later. She was cold and discolored from time. I spent those 3 days hyperventilating and sobbing - not because she was dead - i could accept that - but because I could not even see her. The first time I saw her, at the funeral home. We buried her on the 23rd of December. I held my 6 six year old in my arms during the service as she sobbed like I had never heard a child sob ... like her heart was tearing out of her body. 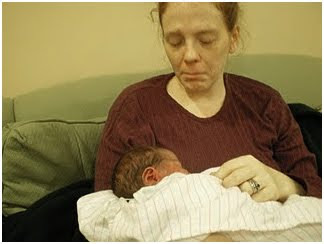 That was the day my milk came in, throbbing ...without a baby to feed. I cried in the shower as milk poured down. The depths I fell to there are unimaginable to most. Since I lost Aquila I have lost much more. I have lost real word friends, online friends, family members. All because I was straightforward in sharing that my daughter would have lived if I had labored and birthed in the hospital. I filed a complaint about my midwife, but 11 months after Aquila's death it is still pending. No lawyers would take the case because CPMs do not carry malpractice insurance. My midwife was not trained well enough to recognize chorioamnionitis, a common complication, or placental abruption a less common one. She was without doctor backup to help her figure out these complications or facilitate a transfer. The Board that licensed her and regulated her is comprised of her friends and colleagues, so the 'punishment' she is set to receive is merely a slap on the hand and has been drawn out as long as possible to protect her career. Oh Liz I am so sorry to share such a day with you. I didn't even know! I buried my father on December 23rd oh so many years ago. My heart breaks for you. Thank you for sharing your story and helping to protect others. Liz I am so sorry for your loss and your experience all around. You and Aquila deserved much better. I really applaud you for the way you have been speaking out around the 'net and for having the courage to continue to do so. Liz , I am so sorry for your loss. God Bless baby Aquila. Liz - I am so very sorry for you and your family's loss. Please let your story prevent another loss. Oh Liz, I am so sorry. Aquila was so beautiful. Liz, your story touches my heart every time I hear it. Thank you for being willing to tell it. I am so, so sorry for you and your family's tragic loss. Oh Liz, from a grieving mother to another, I am sorry, so sorry my heart breaks when I think of you both. Of you, of Aquila, I hate that she is not in your arms, that she did not get a chance to receive your love... she does from a distance. What a heartbreaking story. Liz, I'm so sorry for your loss. Your story tears my heart. I am so sorry. There are no words...No words for the pain of losing a baby, but also no words for the rage I feel at Faith or the awe I feel for your bravery in speaking out. You are a true warrior woman. Oh Liz, again, my deepest condolences. You are so very brave, and I know in my heart that Aquila is very proud of her Mommy. Peace to you and your entire family. I am so sorry and can't say that enough. I am glad that you are seeking justice for your daughter. I am proud that you are her voice! Your a strong woman Liz, I am very Priviledged to know you. Liz, I've read this so many times and it makes me cry every single one of them. No mother should ever lose a child, and I am more sorry for your loss than I can ever express. But Aquila lives on in your fight for justice. She'd be proud of you! Thank you for sharing your experience. I too have experienced the relentless, neverending contraction of a placental abruption, without an epidural. I was fortunate to be in a different situation with a joyful ending, though I am forgoing any future pregnancies due to my increased risk for it happening again. I am glad, for my daughter's sake, to understand there may be a hereditary component to this. This will be a factor for her to consider when she makes her own birthing choices. I am a supporter of homebirth under the right conditions. Your sharing this experience can improve the conditions in the US. Many supporters of homebirth are against any sort of regulation of midwifery, and without regulation, there is also no regulation for the training of midwives. This makes the decision all the harder for a woman in evaluating between homebirth or hospital, both of which posit dangers and advantages. True progress will take place only with full disclosure of the evidence on both sides of the debate. I am so, so sorry for the loss of your precious daughter. God bless you and your family. You are very brave to tell your story so that other families can avoid this grief. What a heartbreaking story and at the same time how amazing that you have the courage to tell it. Although it made it cry I am grateful for you for sharing it. What is even more heartbreaking is your mentioning the loss of real-world friends. You deserve so much support after such an awful tragedy and I wish you all the best. I had an extremely similar birth experience only I was lucky enough to be in the hospital because of advice I received early on in my pregnancy from both my mother (a retired nurse) and a midwife at the Hasidic Temple next to where I used to work. The pain in the hospital before the epidural and emergency C-Section was un-describable and I am not sure I could've lived through it the way you did. You are a strong, courageous woman and Aquila will always be remembered. I'm literally in tears. I'm so sorry for your loss. I am terribly sorry for your loss and your pain. And I am grateful for your courage in sharing it. I hope you find as much solace and peace as you possibly can. Liz, I'm so sorry to read your story. The part about the grief of your six-year-old touches me, because my daughter was almost six when my son was born. It really shows that not only a daughter was lost, but also a sister. Tragic. Please accept my condolences. Thank you for sharing your story. I'm very sorry for your loss. Be kind to yourself; we as mothers make the decisions that we think are best at the time. I wish you ease in your healing. Complete incompetence. There is no excuse for it. This midwife should NOT be practicing. I know your hearts are broken. Keep telling your story. Keep warning others. I have had to hand so many lifeless little babies over to their parents when they come to me in the hospital after the damage is done. It never gets easier. I am so sorry for you and your family's loss. I am so sorry. But thank you, thank you so much for having to courage to come forward with your story. You've saved babies that you will never know about, never meet. You are one courageous woman. Thank you. I'm so sorry about what you went through. But like the lady above stated, you can know you are saving babies as you are brave enough to share your story. You are indeed a courageous woman. Thanks so much for sharing. I am glad you are sharing your story, it takes a very brave person to do so in the face of such onslaught. If even one woman heeds your story and takes the appropriate precautions, and a baby is saved, your child's death although seeingly senseless, was not in vain. i am without words. thank you for sharing. I really am sorry to hear this, it is absolutely heartbreaking and I urge you to keep fighting on behalf of your little daughter. Thank you for your voice. And for being Aquila's. Your daughter is incredibly beautiful. And her story, and yours, are so very important. All these stories are just tearing my heart out. This story is the worst because of the little girl sobbing over her sibling. I have a 5 year old and am 5 months pregnant with my second. 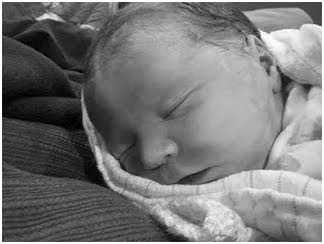 I was considering a birth center birth since my labor and delivery with my son was so perfect. But the fact that it was so far from my house and my husband was so nervous about it led me to continue with my ob and deliver in a hospital again. I feel a little better about this decision after reading all these stories. Although I had a friend who lost her third son during a hospital birth due to doctor's error. There are quacks to be found everywhere it seems. It is a shame that anyone in the business of delivering babies could be so incompetent. I just feel so much sorrow for all the moms on here. Thank you for sharing your stories. I want you to know that up until I read your story I had been strongly considering a home birth. I will now deliver with the CNM and OB I saw for my last three pregnancies. I got so wrapped up in the romantic idea of an intimate home birth that I lost sight of what is truly important, a healthy living baby. I just wanted you to know that through all the pain and sadness, you have made a difference by sharing your stories. Thank you from the bottom of my heart! You may never read this, but I feel moved to reach out to you. I have no salve to offer but sympathy. Thank you for sharing your story. The truth and your testimony of it may, with luck, save lives. Thank you, and for what it is worth, accept my gratitude and care. Liz, I first read your story a few months ago as I was looking for an Austin area midwife for my fourth pregnancy. I did interview one midwife, but couldn't shake my discomfort with the idea since reading. Instead I sought out an OB here for this pregnancy and birth and I've been very happy with my decision. Here's hoping our birth day goes smoothly,but if it doesn't I feel confident that we'll be in good hands. Thanks to you and your daughter we will be in the safest place we can be on that day. I think of you and Aquila often, and I am so grateful to you for sharing. As a homebirth mama myself I know how it must be for you to speak out. Slowly I am finding myself confident enough to join the discussion. Thank you again and peace to you and your family. Oh Liz... I am so heartbroken for you and I am bawling hysterically. That woman failed you. She should be emotionally messed up by this that she would not want to practice anymore. She should have listened to you and she should have known more then she did. I can not imagine being a homebirth midwife and not having enough knowledge to prevent this. I am so sorry Liz. I am so sorry. Don't know if you still read these or not...but I must say thank you for sharing your story. You are an amazingly strong woman, physically and emotionally, to have survived this horrible time. I pray that you and your family have found special ways to honor and remember Aquila. From the time the prolapse occurred and my dr. called emergency C-sec STAT to her delivery time was 11 mins...including transporting to OR(across the hall a few doors down with him riding on my bed holding the baby's head off of the cord internally with his hand), prepping me, assembling the STAT surgical team, putting me to sleep and getting her out...miraculously fast and just in time. Though I'd had more bleeding / cramping than with previous early labor, it didn't seem too alarming after so many deliveries. All monitoring indicated that both of us were doing fine. Then after the membrane rupture, I actually felt blood gushing from my body as we entered the OR and as they were putting me under. Facing two life-threatening and unexpected complications, it was a terrifying and extremely dangerous situation for both of us. My nurse later reported that my uterus was completely filled with blood when they took my daughter out. She immediately recovered from the cord prolapse trauma while I suffered a significant blood loss and, from what I've been told, required an intense surgical team effort. I hope other "experienced" moms will read Liz's story (and details of mine) and realize that when things go horribly wrong, there might only be enough time to get down the hallway to avoid a tragedy. The fact that one has delivered med / complication free multiple times does not guarantee or indicate that will happen this time. When the unexpected (or even negligent) happens at a hospital, there are people, facilities and equipment to address the issue immediately without having to transfer moms, babies and information when seconds count. Liz, I am so saddened by the loss of your precious baby girl. I thank God that He preserved your life so you can raise your other children, share your experience and, hopefully, protect the lives of many other moms and babies. Your story is still being heard, thank you for sharing it. God bless your family. I am in tears and covered in chills. Like someone else mentioned they read and re-read this specific story, so did I...it is taken to heart for sure. Aquila's story is heard...you and Aquila experienced a very important story of life and you are brave and beautiful to have the strength to even share it with us so some of us will now absolutely know to KNOW these dangers are real...after reading these stories I have no doubt in my mind. I am so sorry for all the physical pain, spiritual pain and emptiness I cannot even imagine that you must experience. 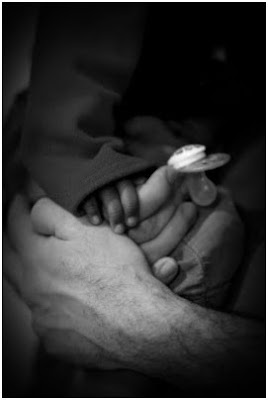 Thank you for talking about Aquila, she was born beautiful, only knew love and the promise of more love and her death is not in vain, in fact I feel your words here are her legacy and she and many of these other babies whose stories were told on this blog, have saved lives. There is a reason you are still here despite the pain, for your own children and for babies who have not become a twinkle in their parents' eyes yet who may have been unknowing of the dangers or not know how raw and horrid the reality of this actually happening is...thank you for your bravery. I am so sorry for all you have endured and your family has endured. Thank you. It has been years since this was posted...but I'm sure your grief is still strong. I am so sorry for your loss.